Explanation: It was a human-made event visible across the Solar System. At the direction of terrestrial scientists, a refrigerator-sized probe from the Deep Impact mission struck Comet Tempel 1 on July 4 at over 35,000 kilometers per hour. The unexpectedly bright explosion was not nuclear but rather originated from a large plume that reflected back sunlight. Pictured above is how the event looked to the Earth-orbiting Hubble Space Telescope. A large cloud of bright material is seen emanating from the comet's nucleus and then dispersing. The area encompassing the comet became over two times brighter in the hours after the impact. 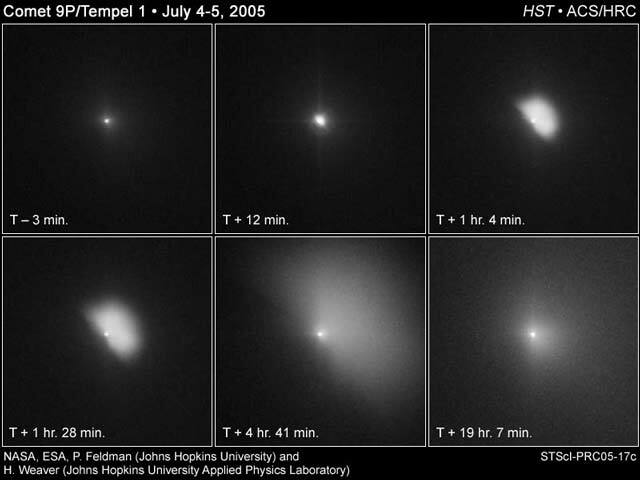 Astronomers will continue to study the images and data returned by Deep Impact to better determine the nature of Comet Tempel 1 and discern clues about the formation dynamics of the early Solar System.